My first day in the Black Hills of South Dakota was spent at McNenny State Fish Hatchery near Spearfish – on the north side of the Black Hills. I went to this place on the advice of my esteemed colleagues in Nebraska, who suggested that I might be able to find several interesting tiger beetle species there: the closely related trio of beauties C. denverensis (green claybank tiger beetle), C. limbalis (common claybank tiger beetle), and C. splendida (splendid tiger beetle) in the red clay eroded banks; C. fulgida (crimson saltflat tiger beetle) and C. tranquebarica kirbyi (oblique-lined tiger beetle) around the lakes; and – again, if I’m lucky – intergrades between the prairie and boreal long-lipped tiger beetles (C. longilabris x nebraskana) along a trail through the shortgrass prairie east of the hatchery. For the first time since Saturday, I awoke to baby blue skies which filled me with an optimism and anticipation that made the 3-hour drive from Chadron, Nebraska to Spearfish, South Dakota seem interminable. What my esteemed colleagues failed to include on that list of species I might encounter was Crotalus viridis – the prairie rattlesnake! Now folks, I’ve seen a number of rattlesnakes before – mostly in Texas – but I’ve never heard this sound in real life, much less heard it coming from a rattlesnake poised to strike. I encountered this fellow in the eroded red clay slopes above the lake, and even though I wasn’t too terribly close it gave me quite a start (my bravery in taking this photo is vastly exaggerated by the twin miracles of telephoto and cropping!). I walked a little more cautiously afterwards but gradually let my guard down over time. 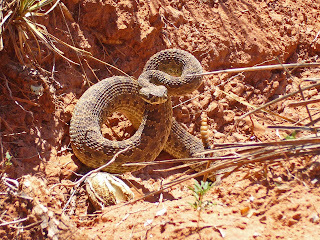 About an hour later, I was startled again by another rattler – I had come within 2 feet of it before it started rattling. I nearly jumped out of my skin, and once I got my heart stuffed back down my throat I noticed several dark juveniles coiled up with her. They slunk away, and I tiptoed back to the car having had my fill of the red clay slopes for the time being. 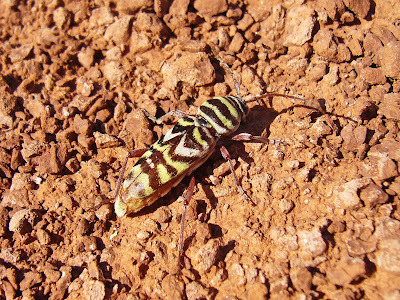 I did manage some success on the slopes before the rattlers drove me away – not with the claybank and splendid tigers that I had hoped to find, which were largely missing in action save for two individuals of C. limbalis that I spotted amongst the annoyingly similar appearing and ridiculously numerous C. purpurea audubonii (clay path tiger beetle). Success instead came in the form of this cerambycid beetle – Megacyllene comanchei. Recently described from Texas, nothing more was published about this species until I recorded a northern range extension into south-central Kansas (MacRae & Rice 2007). Its occurrence in the Black Hills is not only a new state record for South Dakota but also represents an incredible 700-mile northern range extension – on top of the previous one! Actually, Matt and I each found one individual a few days ago in Sioux County, Nebraska (also a new state record) – I had thought of this species at the time but decided I must be wrong and that I should wait until I got back before making an identification. But the capture of these three additional individuals even further north renewed my suspicions, and consultion of my databases shows good agreement with this species – note the white rather than yellow antemedian elytral band and medial portion of the postmedian elytral band, along with the medial and lateral coelescence of the apical and subapical bands, which distinguish this species from the closely related M. angulifera. The records from this trip show that M. comanchei is much more widely distributed than previously thought. Curiously, all five of the individuals I’ve seen (so far!) were crawling on the ground – an unusual habit for Megacyllene, which are normally found on flowers of goldenrod. The type series was associated with plants in the genus Heterotheca, which I did note growing in the area. After escaping the snake slopes, I began surveying the lake margins to look for potential tiger beetle habitat. I was especially interested in C. fulgida – Matt and I had seen a single individual along a dry salt creek in Sioux County. The lakeshore around the upper lake was completely surrounded by thick vegetation – no tiger beetles there, but when I arrived at the lower lake I found some small areas of open ground along one side. They didn’t look very extensive, and my initial search of the area showed no activity. Closer inspection, however, showed the presence of larval burrows, and when I grabbed my fishing gear (the nearest grass stem) I promptly managed to extract a couple of larvae. Okay, so there are tiger beetles here, but which one I don’t know – probably C. tranquebarica kirbyi, which we had seen rather commonly at the same dry salt creek in Sioux County. Although the sun would not set for another two hours, it was quite cool already. I wondered if maybe the adults had already started digging in for the night and began looking for evidence of adult burrows. I looked carefully along the edge of the grassline when I saw movement – it was the back end of an adult C. fulgida kicking dirt out as it excavated its burrow. Success! I dug it out, took a few photos (one shown here) and started looking for similar appearing burrows. I not only found several more C. fulgida in their burrows, but also several C. tranquebarica kirbyi. The larvae I collected may or may not represent one of these species – there are other species associated with alkaline habitats that active at other times during the season. I collected a few more larvae, filled a container with soil from the spot – cutting out a section of salt-encrusted surface to place on top, placed all of the collected larvae in it, and watched them immediately start digging new burrows with their shovel-like heads. More babies to take care of! With tiger beetle success under my belt and the sun setting fast, I decided the day was done and packed up the car. As I was closing the hatch, I happened to look over and saw something of great interest – milkweed! I had, in fact, been looking for milkweed all day long in the hopes – faint, I thought – of encountering the newly described Tetraopes heutheri (Skillman 2007). Mirror Lakes, at the McNenny Fish Hatchery, is the type locality of this species, and although the type series was collected in August I held out hope that the adults might persist until September. 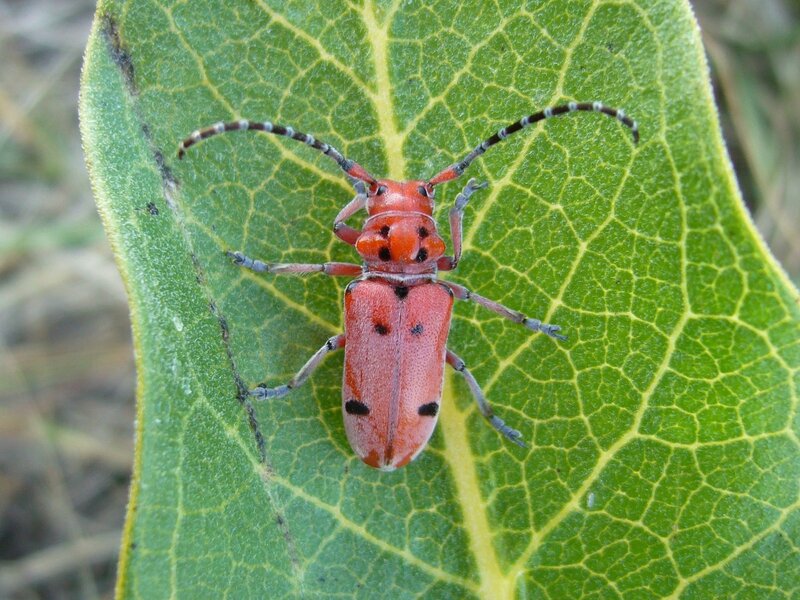 These hopes faded quickly, however, as I located milkweed plant after milkweed plant on the shortgrass prairie above the eroded clay slopes – all completely senesced, with nary a sign of any milkweed beetles. 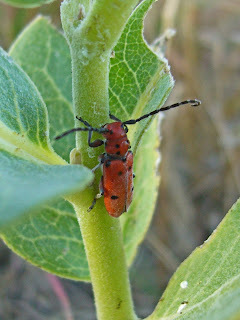 The plant I’d just spotted – only a small sprout – was green, and on it were two milkweed beetles! I excitedly took some pictures, then started looking carefully about and found several more on additional small sprouts in the area. Apparently, the sprouts represented regrowth from late-season mowing of the roadside, as several full-sized, completely senescent plants were found in the adjacent unmowed area. My excitement at having “found” T. heutheri (because of their small size and occurrence at the type locality) was short lived – closer examination of the specimens after returning home showed them to be very small individuals of the more common Great Plains species T. femoratus. I did have some doubts when I found the beetles, since the milkweed species on which I found them is not the same species with which T. heutheri was associated (Asclepias verticillata, a small species with narrow, linear leaves). Day 2 in the Black Hills was spent at nearby Boundary Gulch, just across the border in the northeast corner of Wyoming. This was another attempt to find the C. longilabris x nebraskana intergrades that eluded me at McNenney, and although I failed to find them at this location also, I did find five other species of tiger beetles, including several beautifully marked C. limbalis to go along with the two I found the previous day. After that it was some spurious collecting here and there – including larvae from two spots in the southern Black Hills – as I traveled back to Chadron, Nebraska for the night. 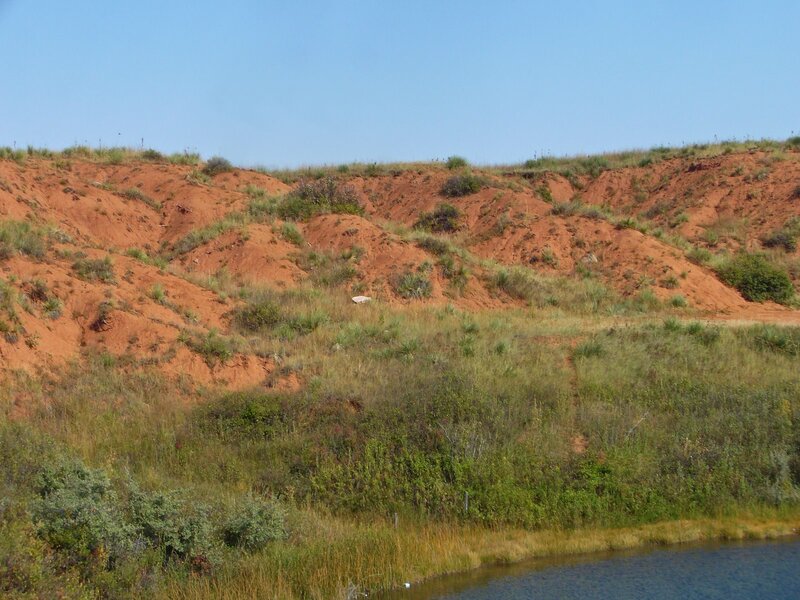 On tap for tomorrow – Nebraska’s famed Sand Hills! 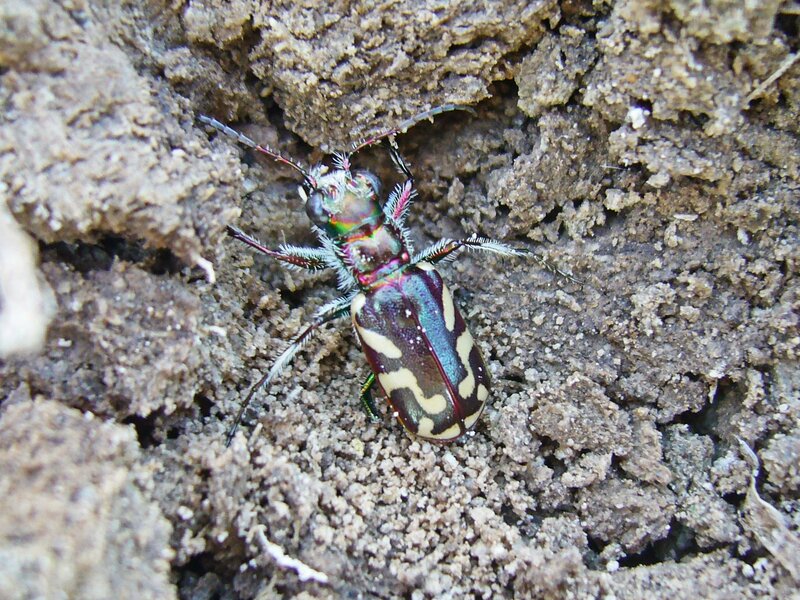 The beautiful sandy tiger beetle (C. limbata) – vivid white and iridescent green to red – hopefully will be found among the super abundant festive (C. scutellaris) and big sand (C. formosa) tigers, and I’ll get another shot at seeing the C. lengi (blowout tiger beetle) that I missed a few days ago. 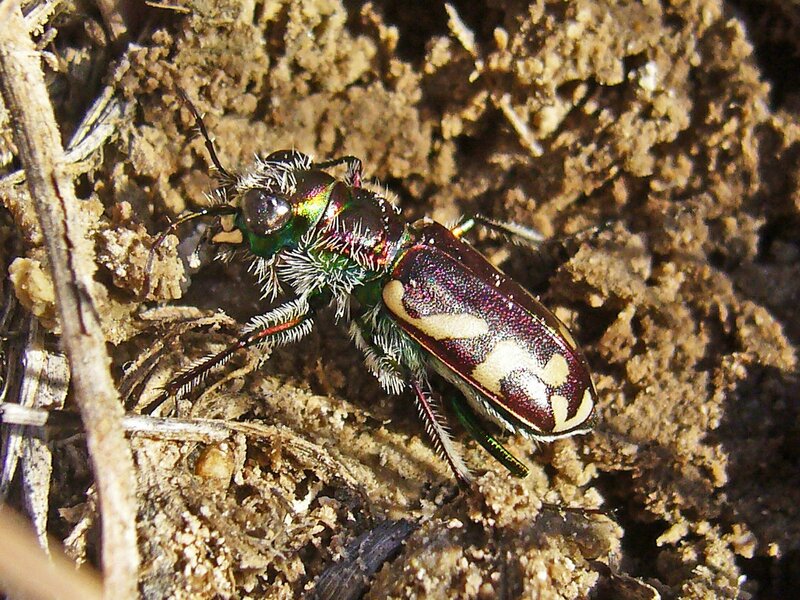 This entry was posted in Cerambycidae, Cicindelidae, Coleoptera, Reptilia and tagged beetles, entomology, herpetology, insects, landscapes, longhorned beetles, nature, Nebraska, plains, reptiles, science, snakes, South Dakota, taxonomy, tiger beetles, Wyoming. Bookmark the permalink. As usual, I’ll have to read it a couple of time to digest all the great commentary and enjoy the great photos. Martha and I used to live in the Texas Panhandle (High Plains). 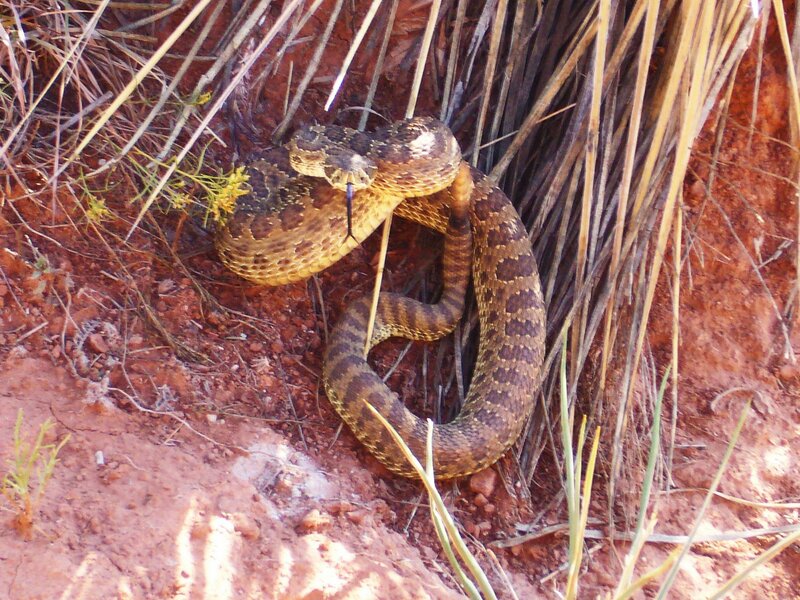 Many a time I have been hiking and jumped over a small ditch and there was a rattler at the bottom. I don’t care what the laws of physics say, you can change your speed, momentum, inertia, and direction in midair. I never did get used to them rattling. Wow, that was amazing. Two of my favorite longhorn genera in addition to tiger beetles. Pierson at al. mention a bright green form of C. formosa in northeast Wyoming. Did you encounter that? We love this blog, it’s so interesting. So many beetles, so little time! Doug – formosa was common at Boundary Gulch, but all of them were red (sigh!). I would’ve loved to have seen the green form. The limbalis, on the other hand, are less maculated than normal and have more green suffused throughout the normally brick-red elytra. I wasn’t even sure what they were at first – simply gorgeous! huckleberry – thanks so much for the kind comment. Yes – so many beetles, so little time! The older I get, the less concerned I am with how many I see versus how much I learn! This post reminded me of the day a colleague and I came across a couple of water moccasin rookeries in the Carolina Bay I worked in. The females in that instance hadn’t had their babies yet though. Great post as usual. Congrats on the new state record and range expansion for the cerambycid beetle. That is pretty cool. I never thought that talking about tiger beetles could be so interesting, but you tell a great story! Makes me want to a) see if I can’t find some rare bugs in my neck of the woods, and b) read up on tiger beetles! cedrorum – thanks for the kind comment. moe – if my stories succeed in sparking any interest, then yes, I have written a good story. Thanks.